We’d like to enable Java developers to start up their container when they start working, and know that’s the last time they’ll have to do it all day. ZeroTurnaround, a Java tooling company, today announced the release of JRebel 4.0, the redeploy-eliminating JVM plugin that allows developers to see changes they make to their apps instantly, without redeploying. “With this latest JRebel release, we’ve definitely broadened our attack campaign against redeploys, the natural enemy of Java developers worldwide,” remarked ZeroTurnaround's CEO, David Booth. According to a recent survey of over 1100 Java developers completed this year, redeploying claims an average of 10.5 minutes of every coding hour, for most developers. “When Java developers want to see the effects of new code (or make changes to existing code), they have to redeploy their entire application - even to see the smallest changes. If you had to restart your computer every time you wanted to send or read an email, that’s a similar level of frustration,” explained Booth. “Our goal is to continue providing tools that benefit the Java world at large, starting with helping Java development to be as fast and iterative as other programming languages, like Ruby or Python,” continued ZeroTurnaround's CTO, Jevgeni Kabanov. 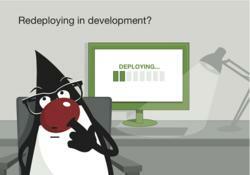 Having already prevented over 33 million redeploys for 11,000+ Java developers worldwide, JRebel 4.0 adds some highly-demanded features such as integration with HotSwap, new EJB support for more versions of JBoss, Weblogic, Websphere & Glassfish, support for anonymous class renaming and a dozen new integrations with various technologies. See more details here. This latest version of JRebel arrives just two weeks after the debut of LiveRebel, a new tool representing a quantum leap in technology to instantly update live production apps across an entire cluster with no downtime, no lost user sessions and no OutOfMemoryErrors. ZeroTurnaround’s “Rebel Technology” is used both in JRebel and LiveRebel for making instantaneous changes with zero downtime to applications both in development and in live production. Customers purchase JRebel and LiveRebel as annual subscriptions, which means that they get full support and upgrades to new versions several times per year at no additional cost. There are free licenses available for Open Source and Scala projects.